Given that I haven’t been running, I’ve found myself with lots of time on my hands. I’ve been walking and doing my physical therapy exercises, as well as gearing up for a busy time at work. It has been hard not running, especially yesterday morning, when the weather was so cool. I did sit outside with my coffee and enjoy the breeze, but it’s not the same as doing my weekly long run. One way I’ve been filling my time is taking piano lessons again. I’ve played off and on over the years, but haven’t formally studied since college. While he was looking for a guitar teacher, my husband found a music school not too far from us that offers piano instruction. So on Sunday afternoons, I’ve been taking a half hour lesson with a teacher. While I miss running, it has been nice to indulge in the first passion of my life, music. I’ve been going through pieces that I’ve tried practicing on my own, but need help with. I may finally be able to play through my Charlie Brown Christmas book (jazz pieces give me a harder time than classical) this year! The ‘cross training’ exercise has been fun, but trying to remember all my theory has been a little strenuous. During one lesson, I actually thought I was going to blow a fuse, trying to remember chords! I still love Chopin, and am still not a fan of Bach (I liken him to kale — something that’s supposed to be good for you, but I just can’t stomach). It’s been fun going through the stacks of music, playing through old movie soundtracks. It’s also like a diary — I associate pieces with particular times in my life. I can look at the songs I played in fourth grade (and see the stickers I got, signalling I had done a good job on a piece), or see what piece I played for my Christmas recital my junior year of high school. It’s fun to see where I started in terms of skill, and to see how far I’ve come and where I can still go. Hearing that I can run again will definitely be music to my ears, but for now, this kind of music will have to suffice. But I can live with that for a while. I had a great time in California this past weekend, catching up with my oldest and dearest friend and college roommate. Like we always do, we packed a ton of stuff into a long weekend — great food and wine, the Katy Perry concert, quality beach time, museum exhibits, grape stomping (which my friend says is how they cross train in California) and a movie. My visit started with breakfast in Hermosa Beach (like we have the past few visits), and finished with me shaking sand from my feet before we left Zooma Beach in Malibu so she could drive me to the airport. I actually was wearing my swimsuit under my clothes for the flight home, but it was definitely worth it! I always take an extra day since I usually fly home late and need time to recover, but the marathon of fun is one race I’m always up for. As promised, I have pictures! 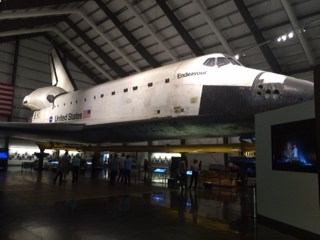 Here are a couple of my favorites — my first time every stomping grapes at Lorimar Winery in Temecula, California, and seeing the space shuttle Endeavour at the California Science Museum. We also caught up each other on our lives. I’ve gone to visit her every year since she moved to California eight years ago, and we always just pick right back up in terms of conversation. We can laugh and joke as we always have, and talk about everything. Or we’re fine just driving in the car, listening to our iPods. That’s the mark of a true friend — someone you can talk with about anything, but with whom you can also enjoy moments of silence. She got engaged over the summer, so we talked about plans for her upcoming wedding (I’m one of her bridesmaids) and toured some wineries where she was thinking about holding an exchange of vows ceremony/reception. I talked with her about my recent major surgery, and about some major decisions I may have to make in the next few months. In addition to getting married, she may have a major change on the horizon with her work later this year. So it was great to be able to speak with someone who’s also going through major changes. It was good to vent, and it was just good to have fun — to stomp grapes, to go on a hayride, to watch Guardians of the Galaxy, to sample macaroons at Bottega Louie (apparently, they’re very well-known for their macaroons — even my co-worker said she wanted to visit them someday). I also got some Vitamin D and color at the beach — since I haven’t been running, I haven’t been out in the sun as much. It’s funny that I’m finally getting more of a tan with fall officially underway, but better late than never! In short, I got caught up with some quality friend and vacation time. I’m still behind with other things (including getting my car inspected — I was driving home from church, and suddenly realized it expires on Tuesday), and October will be a busy month for work, but I definitely got a good dose of fun and relaxation. 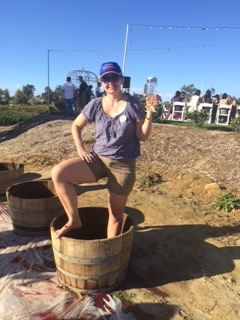 I’m back to my physical therapy and cross training, but it felt good to ‘cross train’ with some grape stomping and fun. During one of our talks, as I wondered aloud about the choices I had made, I lamented the fact that I’m 41. But I loved the perspective she had to offer — sure, we’re in our early 40s, but we’re likely only about halfway through our lives. It made me hopeful for the future. That, and the fact that my back feels like it is slowly but surely healing, is making me confident that the second half of the marathon called life will be filled with good miles, good friends, and plenty more good times. I’m in California this weekend, catching up with my dear friend and college roommate (and I’ll have pictures to post the next time I blog, I promise!). But I did meet with my physical therapist this past week and have started on the program of prescribed home exercises. The routine includes stretches and exercises to strengthen my core and left hip. As part of this routine, I get to dust off the exercise ball in my home office for back and core work. I went through all the exercises on Wednesday night for the first time, and was sore today! But that’s to be expected. In the past, I haven’t always been faithful with doing core work and other dreaded exercises (especially burpees). Why can’t I just run, I ask myself? And I should know the answer by now — it’s the core exercises and dreaded stuff like burpees that will keep me running. It’s easy sometimes to cut corners, especially during fall marathon training season. Some days, it’s a rush to get to the track, and by the time the track workout is done, I’m cold or starving and just want to get home. And I’ll tell myself that I’ll do core when I get home. Sometimes it happens, and sometimes not. As part of this healing process, I’ve made up my mind to do things right. That includes making sure everything is healed and strengthened, especially the core. I definitely don’t want to be sidelined this long again! Now, you’re probably asking, how is she doing all this while she’s in California? Well, the answer is that I’m doing some of the exercises, but not everything. I tried to pack light (since I have to be careful still with bending and lifting), and decided I wouldn’t have the space for the exercise ball in my bag. But I plan to hit the ball again once I return from my trip. You may not think of visiting an old college friend as a core strengthening exercise, but it just dawned on me that it does count as core work, in its own way. I’ve gone to visit my friend every year for the past several years. By doing so, I’m maintaining the strength of our friendship, which will hopefully endure for the rest of our lives. It’s the same with going to church, spending time with friends and loved ones, taking the time for doctor’s visits or to prepare a healthy meal. Sleep is another way of building core (and it also allows the body to heal itself, according to my reading). It’s all about building a better core within ourselves, not just physically, but spiritually and emotionally. During my hiatus from running, I’ve been looking at ways to build my core in other areas of my life. This includes working on my marriage, spending time with family and friends, and devoting time to things such as reading for pleasure. I love running, but it’s amazing how much time it can take, especially marathon training. And while I miss running, it’s nice that I can use this time to build a better core — in more ways than one. I returned to my home and to work this past week after being out for over two weeks for my surgery, most of which I spent at my parents. While I definitely needed the time to recover (and got some quality reading and family time), it felt good to get back to my life. And though I definitely enjoyed the time at my parents, the invalid’s life is definitely not for me – I’m much too independent! I was starting to chafe at the restrictions — like the kid who’s sick of being stuck at home sick, and who’s bored with TV and their crayons and wants to be out playing with their friends again. My parents did a great job of taking care of me, but towards the end, I was definitely ready to start taking care of myself again. That realization came when my mother insisted on shaving my legs for me (so I wouldn’t have to bend) before we ventured out to walk around the local mall. I didn’t have any jeans with me, and I didn’t want to walk around with legs looking like bristly pipe cleaners. But that moment made me appreciate having the ability to do basic things for myself — things that I had taken for granted before. I also was glad to get back to work — I didn’t realize how much I had missed it. It felt great to be welcomed back with hugs from several co-workers! I’m glad I went back at mid-week though, so I can ease back into my routine and sort through enormous pile of emails awaiting me in Outlook. It took me most of one day just on the email alone! Returning to my daily life felt like emerging from a warm cocoon and walking on wobbly legs. I’ve actually been dealing with some calf cramping as a start walking more and going up and down stairs. I can tell it will take time to get my old stamina back even for work, not to mention any running or intense physical activity. I got the all-clear from my surgeon to start increasing my activity level again, including physical therapy exercises. I can’t run yet, but I can walk, swim and do the elliptical. I will definitely be starting from scratch, which is bad and good. I miss being in the great shape I was in earlier this year, but starting from scratch does have it’s advantages, including the chance to rebuild myself in the best way possible and lay a firm foundation for the journey ahead. I admit, seeing friends’ posts on Facebook are posting about their long runs is making me itch to run. The cooler temperatures this week — a sweet preview of fall weather that can’t come soon enough — also make me long to hit the running trail near my house again. But I keep reminding myself that slow and steady will ultimately win the race, and that I need to thoroughly heal. It just struck me as appropriate that fall officially kicks off this coming weekend. Rebuilding myself will mark a new season in itself, and as the weather and leaves transform, I’m hopeful that I’ll start to see a transformation in myself as well. The monthlong wait for my surgery will end early tomorrow morning. I’ve already filled out my paperwork (and even got my patient ID tag when I went for my pre-op appointment last week). I’m off all this week so I can take care of errands, pack for my extended stay with my parents (who are looking after me after the surgery) and see my eye doctor for my annual appointment. I’m looking forward to hopefully feeling better, but not wanting to get my hopes up too much like I did when I had the shot. I’d rather be pleasantly surprised than suffer another disappointment. Going for pre-op last week definitely made the surgery more real for me. On Friday, they took a blood sample so they could cross-type it against their blood supplies to make sure they had mine in stock (hopefully, I’ll finally find out what type I am – for some reason, nobody ever told me!) They said it was unlikely that anything would happen, and the procedure itself is one done routinely, but that .9 in the 99.9 percent odds gave me a momentary pause. And for some reason, I keep seeing the Operation board game and the patient’s red nose lighting up. I knew they would be drawing blood at the appointment, but I started feeling weak when they tied the plastic tube around my upper left arm and told me to make a fist. The nurse commented that I was trembling, and afterwards, gave me some juice because she was afraid I would pass out. I’ve never been good with needles, but the thought of having blood drawn again, not having a doctor tinker with my spine, is making me nauseous! I haven’t been outwardly nervous in the month leading up to the surgery – I’ve deliberately not thought about the details too much. When my mother and mother-in-law were asking me about the surgery this past weekend, I found myself forced to think about the details of the procedure. And then the anxiety began to kick in a little. My husband has been trying to cheer me up the past few days, joking with me that I should make the surgeon play the Operation game before the surgery – if he made the red light go off one too many times, he couldn’t operate on me! My husband will stay with me overnight at the hospital Wednesday, and hopefully, I’ll be able to go home with my parents Thursday and not Friday. My plan is to stay with them a few days. My husband has to work, and I thought it would be easier to let my parents play nursemaid. If I need something, they can get it for me, and though I’ll probably spend a lot of time reading, it will be nice to visit with my parents and play endless rounds of Yahtzee with my mom. All month, I feel like I’ve been on a roller coaster that’s slowly been climbing a hill of death-defying height before plunging back down to earth. My stomach is churning with anxiety, I know my heart will feel like it wants to push past my lungs on the way down, but I’m making myself yell and smile and wave my hands over my head and try enjoy the ride. I will give an update of how things go on Wednesday. See you then! The blog, Your Body is Not Your Masterpiece, urges women to stop obsessing over perfecting their bodies, and that our bodies are not projects, but paintbrushes we use to create real art, whether it be through our spirituality, our relationships or our work. Once I turned 10, I grew out of my chubbiness. Today, I look at pictures of me in junior and senior high school, and I see what looks like a normal, healthy, sometimes pretty girl. But in the back of my mind, I saw myself as not thin enough, and therefore not good enough. Problems with acne, haircuts and clothes that I deemed not cool enough compared with others, and self-esteem issues due to the cruelty and indifference of so-called friends just exacerbated my negative feelings towards myself. I’m not saying this to hurt my mother — like all of us, she did the best she could, and I wouldn’t trade her for the world. And I know that I’m not the only woman who feels this way (given the dozens of diet programs and pills advertised on TV that promise to deliver amazing results, the plethora of exercise programs out there, as well as plastic surgery and other beauty enhancements available.) Combine these with the magazines that feature models with figures the majority of women will never have (and the airbrushing of photos to make these women even more perfect), and clothes in a number of stores that seem to be made for women with no curves at all, and it’s no surprise that women today have body issues. Even when I’m shape, I never feel like my thighs are thin enough (and trust me, running doesn’t make cellulite go away. I’ve tried!). For a long time, running and exercising were a way for me not only to mold my body, but a way of addressing the insecurities I felt about myself. Like I’ve mentioned before, being sidelined with an injury has given me time to examine other areas of my life, and I realized that I was so focused on running, I had neglected other areas of my life, such as a deeper relationship with my husband and friends, as well as nurturing other areas of interest. The idea that I should stop obsessing over the shape of my paintbrush (my body), but what I paint (the relationships I build, the work I do, my spiritual life and other interests), really hit home with me. I also realized that I’ve spent WAY TOO MUCH TIME obsessing over what my body should be, and not what it is, and learning to love what I have. It’s ironic that I was thinking about all this while watching American Ninja Warrior, a show about people who push their bodies to the limit to do incredible things – run, climb, jump, and crawl up tower walls like a spider. They’ve made the bodies and their athletic abilities projects — one contestant even quit his job to focus on training for the American Nina Warrior finals in Las Vegas! I found myself really getting into the show, cheering, yelling, knee bouncing with anxiety as I watched people struggle on the course. I don’t see myself actually competing on the show, but would love to be in the shape that some of the contestants are. But the article made me realize that my body is not the ultimate project, nor my hopeful future marathon times, but what I give to others and to the world in other areas of my life. And that is the real masterpiece that I can contribute. This week is my last full week in the office before I take time off for my back surgery. I have my pre-op appointment early Monday morning, and then I get to go into the office and try and cram in some of the assignments I have to turn in before I leave. I suspect I won’t finish them all, and will likely have to haul my laptop home so I can finish things up for this month. Not running has been frustrating, particularly when I receive my weekly newsletter with the group training schedule. It’s strange not to be rushing to the track after stopping at home to change and have a quick snack or preparing my fuel belt and laying my clothes out Friday night before the long run Saturday morning. I have found ways to occupy my time during this forced break (including the book challenge I wrote about last week and my return to piano lessons, which I’ll blog about in the future), but I’m still finding I don’t have time to do everything I want, like start outlining the novel I want to write during National Novel Writing Month this November, and should want to do. For example, I should spend more time cleaning house, but frankly, I’m not that good at cleaning, and the house just keeps getting dirty, so why bother? I do the basic necessities, such as laundry and running dishes through the dishwasher. I actually swept the downstairs floor today, but didn’t feel like I made much of a difference! I am riding the exercise bike and doing some swimming, but as any devoted runner will tell you, it’s not the same, not by a long shot. This is the first time in my life that I have been so sidelined with an injury (and I suspect it won’t be the last, given that I’m getting older!) It’s given me a newfound appreciation for not only being able to run (even if it’s a crappy long run or track workout) but made me appreciate just having good health, something I think I have taken for granted. It’s also gotten me thinking about bucket lists. I’ve kicked around different ideas about places I want to travel, marathons I want to run, and other things I want to accomplish during my life. A friend I had lunch with this weekend told me that I’m too young for a bucket list, but given that the first 41 years of my life went by in a blink, I’m thinking I should actually type up the list. I’ve also decided to use the blog as a way of examining my life – what is actually going to make me happy, and what goals do I really want to achieve. There are a few things I’d previously wanted to do that I’m more than happy to leave behind, such as sewing (that damned bobbin thwarted me every time), knitting (I really think I have four thumbs instead of two) and skydiving (I’ve had friends rave about it and say I should jump, but I just keep seeing myself panicking at the last minute, and someone having to push me out). Renewing my scuba diving certification and writing a book are still high on the must-do list. I realized the other day that I’m finally making progress on something that hasn’t really been a bucket list item, but something I needed to learn for my own well-being: Making peace with imperfection. I’d read about it in Don’t Sweat the Small Stuff (mom gave it to me, hoping I’d finally get the message). I’ve always been hard on myself in terms of my achievements and shortcoming – someone told me it stems from being an only child, which may be true. To be honest, I think I’ve used running in the past as a way to escape, not just from problems in my life, but from my imperfections. There’s nothing wrong with using a run to blow off steam from a bad day, but I think I sometimes used it as a way to block things out. Not running has forced me to look at myself and my life, and I’ve come to a realization: I can beat myself up for gaining weight and not being in the shape I was in January, for not saying the right thing at a social function, for fumbling something at work, for this or that so-called shortcoming, or I can let it go. I’m also not going to get down on myself for not getting everything accomplished that I hope to in a weekend, or for watching mindless reality TV on a Friday night (like I did after another LONG week). In short, there’s always going to be deadlines or something that needs tending around the house. Even when things are going well, not everything will go according to plan. I don’t think I’ve yet had a good race day where I got everything exactly right; perfection, I’ve realized, is a never-ending pursuit. And while I still hope to keep pursuing more great race days, I’m learning to be more accepting of myself and the challenges I’ve been facing. I was shocked and saddened to hear about the passing of Robin Williams earlier this week. From Mork and Mindy in the late 70s and early 80s to his decades of filmwork and stand-up comedy, Robin Williams touched so many lives (including mine) with his strong comedic and dramatic abilities. I loved him as Mork, and so many of his movies were classics and favorites of mine, from The World According to Garp to Mrs. Doubtfire to Good Will Hunting. I couldn’t help but feel deflated this week after hearing about his suicide and his recent struggle with depression that caused him to take his life. Truly, a bright light that illuminated the world with such positive rays has been extinguished. Having struggled with depression in the past, I felt for him, and it makes me ache to know that he was in so much pain. One of the many tributes posted to him on Facebook sums it up – Be kind to everyone, because you don’t know what kind of journey they’re going through. In the marathon called life, some people are faced with enormous challenges and struggles, and sometimes, the ones who don’t seem to be struggling are the ones having the toughest go of it. The black dog – as Winston Churchill described depression – can plague even those who seem like they have everything. Of all his movies, the one film that made the biggest impression on me was his turn as Mr. Keating in Dead Poets Society. I was 16 and a junior in high school when the movie came out, and it made such a huge impression on me. We watched it in English class – I think I even wrote a paper on it – and I really took to heart the movie and Mr. Keating’s call for his students to seize the day and to make their lives extraordinary. Maybe it was because I was 16, with my life still stretched out before me, and the fact that I truly wanted to make my life extraordinary – maybe that was why the movie resonated so strongly with me. Carpe diem was a motto I wanted to try and live each day, not just some motivation saying on a coffee cup. I could relate to the students’ struggles to achieve what they wanted, whether it was a dream career, a dream date or just to enjoy some good rock and roll music. I also was young, felt invincible (and probably a little hormonal too) and was just ready for the warm-up act called high school to end and for real life to begin. I also was excited to see a recent commercial campaign that had a clip from the movie, where Mr. Keating is asking the students what their verse would be. Some might argue that it’s just another example of a great 80s movie being cheapened to sell something, but I really liked how they did the commercial. And how could anyone measure poetry like you would a figure from geometry? J Evans Pritchard should have been shot, or at the very least, forced to do geometry problems for the rest of his life. I spent a lot of time this week thinking about the movie, hearing the music in my head and thinking about the movie’s classic scenes. The ending scene is my favorite movie scene of all time and one of the best scenes ever: Todd and some of the other students standing on their desk as Mr. Keating makes his final exit, and instead of saying good-bye, they salute him with Oh Captain My Captain. Not all of the students stood, but the ones who did definitely got what Mr. Keating was trying to teach them. It made me wonder if Todd became a poet, or if Knox married Chris. And whatever happened to Nuwanda? Probably sent to military school, and probably still a rabble-rouser. In a lot of ways, I still feel like I’m working on my verse. So far, I like what I’ve written, but there are more adventures to be had, more avenues to be explored, and more poetry to taste and let drip like honey from my lips. I’m still looking for the right words, and hoping that someday, I’ll be able to write a conclusion to my verse that would make a dead poet proud. I’d read about some folks posting to social media pictures of themselves standing on their desks. I had debated doing this, but wasn’t sure what my boss would say, or whether my desks at work and home could take the weight. I had thought about throwing a desk set from somewhere, but couldn’t get access to the roof at work. So I thought I would post my tribute here. So good-bye, Oh Captain, My Captain. You are gone too soon, and will be sorely missed.